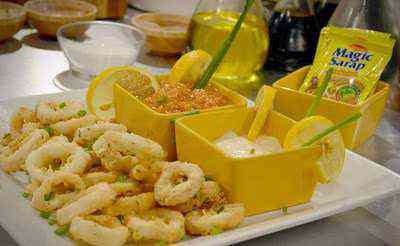 Marinate squid rings in calamansi juice and MAGGI MAGIC SARAP for 5 minutes. Dredge in flour and deep fry in hot oil. In a saucepan, heat olive oil. Saute onions, garlic and tomatoes until tomatoes are soft. Add parsley, water, MAGGI MAGIC SARAP and sugar. Simmer for 5 minutes. Transfer into a blender and puree until smooth. Add olive oil and mix well.